Shortly after graduating from Bridgeport High School this year, Imoni Saab received a phone call that has had her counting down the days for the 28thAnnual West Virginia Black Heritage Festival, to be held in Clarksburg on September 7-8. In the call, she answered questions from various members of the festival board and shared with them her aspirations and her heritage. Last week, she received a letter informing her that she was not only the West Virginia Black Heritage Scholarship recipient, but also the festival queen this year. Saab, along with other applicants, had a rather extensive process to endure in order to be considered for the scholarship. In addition to being of African-American decent, she also had to be currently enrolled in college, have at least a 2.5 GPA and submit two letters of recommendations. She also shared her extra-curricular involvement, community service activities, and explain each of her honors, awards and recognitions. Finally, she submitted a 300-word essay on an African-American who inspired her and the impact of the Black Lives Matter movement on her life. For Saab, coming up with the list of activities was easy. Known for excelling both academically and athletically, she also spearheaded the creation of the Bridgeport High School Humane Society Club and was an active member of DECA. She serves on the Harrison County Dream Team to help her peers make good choices and she volunteers regularly at the Harrison County Humane Society. 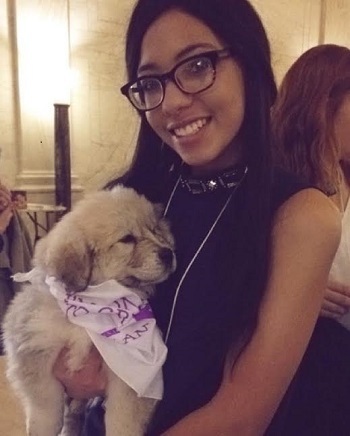 Saab has proven to be a leader in virtually every organization with which she has been involved, including her representation at the West Virginia State Capital, where she fought for animal rights. She played both soccer and ran track for BHS and competed in the West Virginia State DECA marketing competition as well as the WV High School Business Plan competition. Her work with the Harrison County Dream Team allowed her to work collaboratively with all high schools in the county to raise awareness of drug prevention resources available. Saab made her first appearance as West Virginia Black Heritage Festival Queen at the Kick-Off Luncheon. She will be present throughout the festival, which will include a free youth block party, live musical performances, specialty foods and more. This is the 10thyear that the festival has named royalty for the festival and each member of the royal court was chosen based on community involvement, how their African-American roots shaped their lives, their aspirations, and how well they would serve as a positive role model for local youth. Now a freshman at West Virginia University, Saab plans to continue initiatives that will protect animals. She also plans to get involved with campus activities where she can hone her leadership skills and make a difference. But, for one very special weekend in September, she will be traveling back home to Harrison County to reign over a festival dedicated to her heritage and, for that, she is both humble and excited.